Thargoid wrote: Now that is looking good. May look nicer without the model's edge-lines in it (especially at the back and around the engines and the bridge area) but that's just judging from a simple static image. 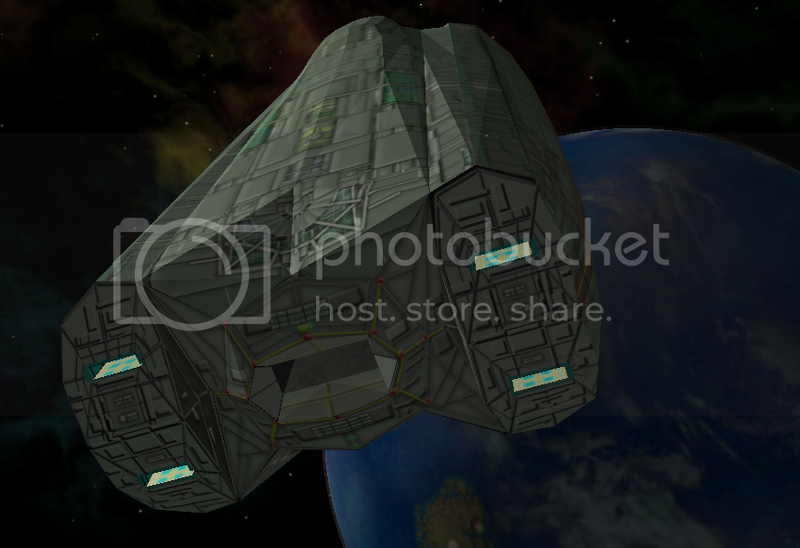 And I guess that's the parts where it isn't textured yet (especially at the back and around the engines). 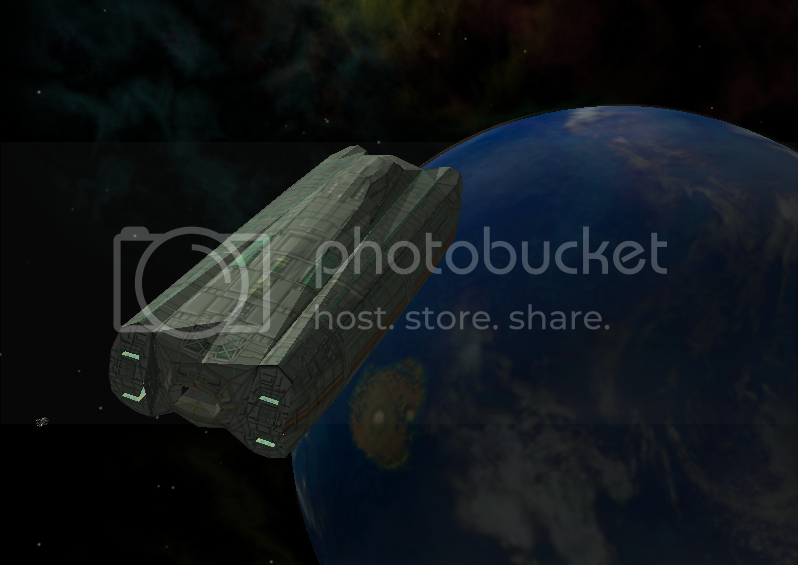 So I think the edges will go away with the ongoing texturing. Update: Emerald Texture done. Now starting on the emission map. Slow work. 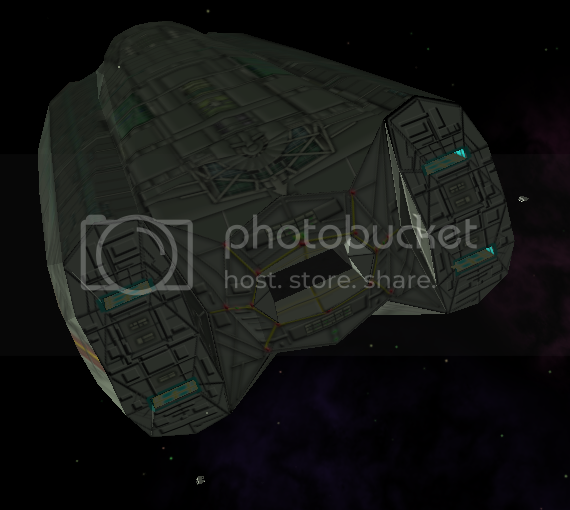 As noted the shuttles themselves aren't skinned yet, and only the diffuse map is done on the ship itself. 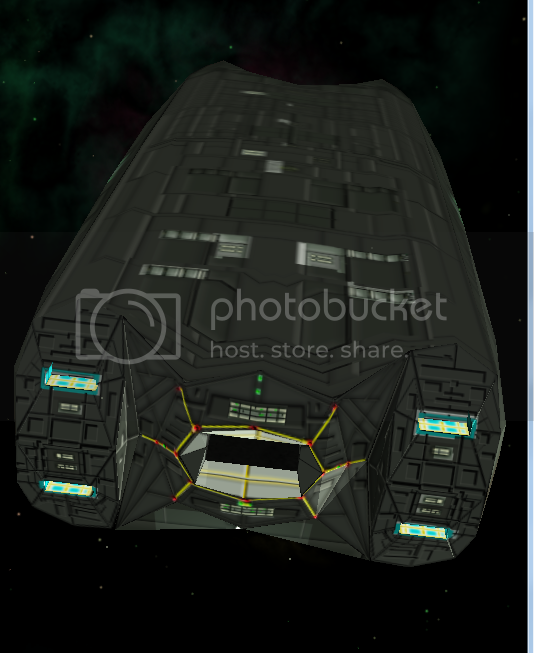 But it looks nice to me so far The shot only shows 2 shuttles launching together, but it can fire off up to 4 simultaneously plus of course other stuff from tghe main docking bay itself. Coming along nice. Can you adapt the OXP in such a way that it supports the emission map? The edged around front and read could need some smoothing, don't you think? Smoothing could be good. Would be even better if someone (Griff ? ) could help with making a normalmapped version of it. pagroove wrote: Coming along nice. Can you adapt the OXP in such a way that it supports the emission map? Emission map? Did I miss something? The zip file only had I think the diffuse map in it, or am I getting confused? It looks really - massive - even without other things to give it a sense of scale which is an achievement - it's a lovely texture BUT something that massive without an underlying normal map - the texture just looks wrong at acute angles. Sorry Thargoid. I forgot to include it in the Zip file. I rezipped it and sent you a pm. If you don't know how to include it you can ask it to Smivs. @ Daddyhoggy. 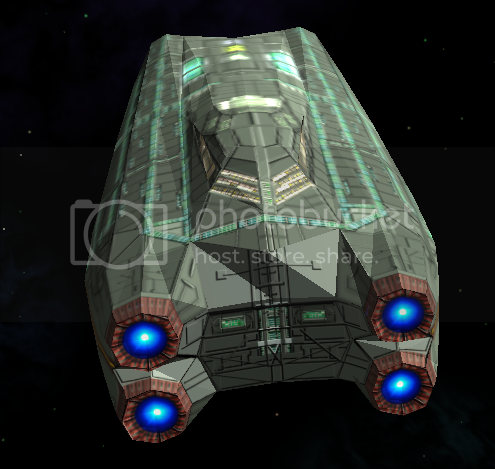 I used one of your engine glows in this texture so you could say this cruiser has 4 StarHoggy engines . pagroove wrote: @ Daddyhoggy. 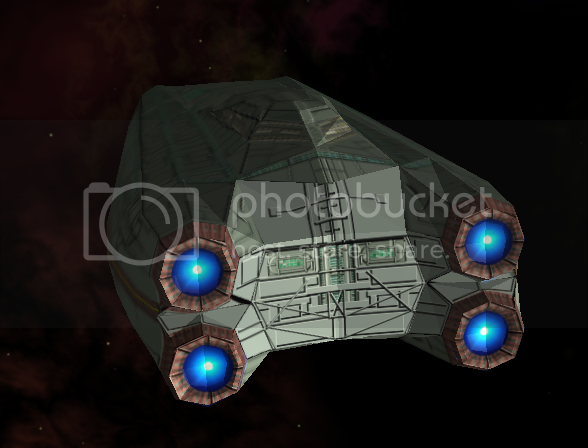 I used one of your engine glows in this texture so you could say this cruiser has 4 StarHoggy engines . That's looks really lovely Guys! Can't wait to see what your going to whip up next Thargoid now you've got a shader capable machine! the flickery texture might be caused by 'z-fighting', you haven't accidentally doubled up on polygons somewhere around there or something? In my few experiences with Wings3D I noticed that it sometimes screws up the normals during exporting, leading to symptoms like the weird shadow. 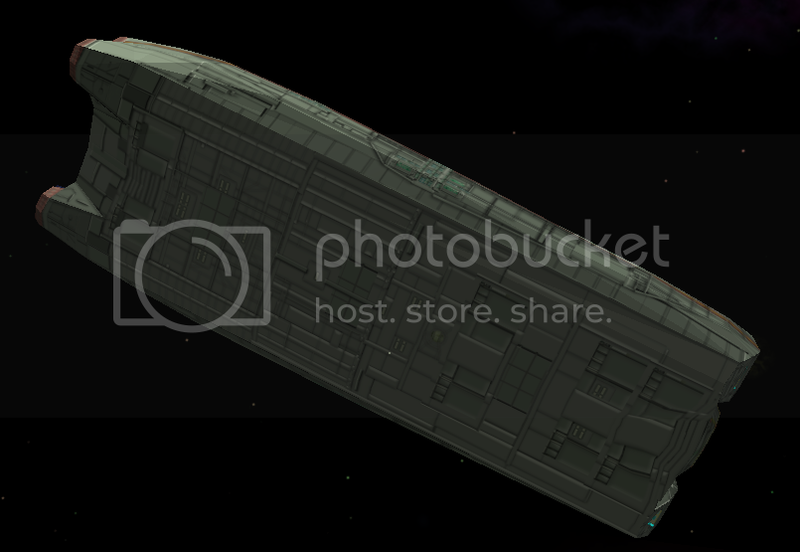 In these cases I have opened the OBJ or DAT file in DryDock and used its 'recalculate normals' option.